Mark Tully wrote this book with his partner, Gillian, although his is the only name on the front cover of the version I have. Tully was born in India, but educated in the UK. He then returned to South Asia as a journalist with the BBC. He later left the BBC and became a journalist in New Delhi, working with Gillian, a translator. He has written two other books on India, also with Gillian. 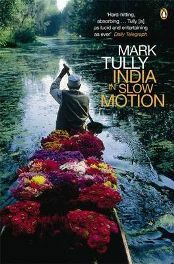 The book is a description of one of Tully’s journeys around India, investigating a number of issues related to India’s governance. During their journey, they meet a number of men and occasionally women who are trying to contribute, in their individual ways, to the smoother running of the country. These issues include politics, economics, religion and culture, such as child labour in the Indian rug-making industry, corruption, Kashmir and the IT industry. I found the chapter on child labour particularly interesting; the author explored the rug-making industry in India from the point of view of an ex-Colonial, whose rug-making business was suffering from an American competitor’s advertising campaign. The campaign insisted that only this particular company could 100% claim that their rugs were not made by children. However, the ex-Colonial explained that this was a virtual impossibility; not all the looms which made the American company’s rugs were registered and therefore it was impossible to state categorically that no children were used in the making of the rugs. He also raised the issue (without forcing his views on the reader) that although child labour is obviously wrong, people in the West forget that by boycotting rugs that could have been made by children, they are not necessarily helping those children. They may either be forced to support their families by taking on even more dangerous work or even starve to death. The book is very much written in a journalistic style, which is not surprising considering that Mark Tully is a journalist. I liked the style; it was uncomplicated and easily readable, with a lot of dialogue as well as text. I was also pleased to find that although he raised certain issues, he didn’t obviously force his views on the reader; we were left to agree or disagree at will. The book explored the way in which India was governed, looking at the issue from different viewpoints, without coming to a decision about which way was right or wrong. One criticism that I have is that there is an awful lot of information included in this book and sometimes it was overwhelming. I found the chapters on religion particularly difficult to read; there were so many Proper nouns that were new to me that I really could have done with a glossary to refer to instead of constantly having to turn the pages back. There was a helpful map in the front of the book laying out the places to which the Tullys went, but this wasn’t really enough. This book is part of Penguin’s travel collection and as such, it has been listed in the section on travel. However, as a travel guide, I would say that it is good for providing background information only – there is no real comment on which places are good to visit. I mention this so that if you are looking for information on which places to visit, rather than background information, you may want to look elsewhere. This was a fascinating book about a fascinating country, covering a variety of issues. I think it was a good base from which to build up a better knowledge of India. The author comes across as being very honest; he clearly loves India and the Indians, but at the same time is aware of its failings. There is occasional humour, which helps make the book less dry than it otherwise would have been. However, if you are looking for something that describes rather than raises issues, then this is not the book for you. No Comments on "Travelling around India"